Following the North American debut of the all- new 2012 Prius c at the 2012 North American International Auto Show in Detroit, Toyota Motor Sales (TMS), U.S.A., Inc., will bring this dynamically styled, five-door hatchback to market in March 2012, extending Toyota's Hybrid Synergy Drive to the subcompact segment. The letter "c" represents "city" in the Prius c name. Designed to function as an urban-friendly vehicle with an engaging driving experience, hatchback utility, and an EPA-estimated city fuel economy rating of 53 mpg, * Prius c offers the highest city mpg rating of any vehicle without a plug. 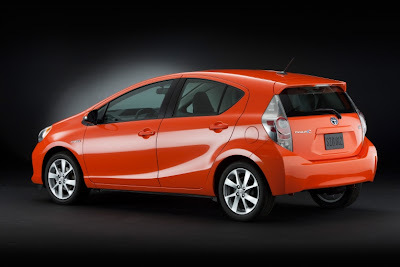 The all-new Prius c joins the Prius Family, which includes the third generation Prius Liftback, the versatile new Prius v and the Prius Plug-in Hybrid, which will also be available in early 2012. With over two and a half million units sold worldwide, Prius remains the world's premier eco-vehicle brand, and it has established consumer trust in hybrid technology. With Prius c, Toyota will make the market's most proven hybrid technology available to subcompact car shoppers with a starting MSRP of $18,950. *2012 EPA-estimated 53/46/50 city/highway/combined mpg. Actual mileage may vary. The Prius c will be available in four grades, offering desirable features, equipment, and enhanced capability providing consumers compelling value. The Prius c will offer many standard features such as automatic climate control; tilt-telescopic steering wheel with audio, climate, multi-information display and Bluetooth® hands free phone controls; and remote keyless entry with illuminated entry among a long list of standard equipment. The smaller scale of the all-new Prius c becomes apparent in comparison to the familiar proportions of the midsize Prius Liftback. This reduced vehicle size necessitated a challenging scaling-down of the Hybrid Synergy Drive to adapt the propulsion system to the Prius c. The Prius c is smaller and lighter than its midsize Prius Liftback stable mate with 19.1 inches less length (157.3 vs. 176.4 inches OAL), and 542 lbs. less weight than the Prius Liftback (2,500 vs. 3,042 lbs.). The Prius c rides on a wheelbase that is nearly six inches shorter than the midsize Prius (100.4 vs. 106.3 inches). In adapting the Hybrid Synergy Drive to the smaller Prius c platform, each of the system's major components were re-designed to reduce weight, scale and improve vehicle efficiency. The Prius c's effective packaging design strategically situates key drivetrain components within the chassis to help optimize interior space and handling. The gasoline engine, transaxle and power- control unit are optimally positioned within the vehicle to help enhance weight distribution and lower the center of gravity, which aids handling. The hybrid battery is positioned directly beneath the rear seat while the fuel tank is beneath and just aft of the rear seat. Such positioning ideally distributes mass within the wheelbase improving weight distribution to help enhance handling. By strategically placing the hybrid drivetrain components and battery to maximize interior space, the Prius c is able to offer 104 cu. ft. of interior volume (87 cu. ft. passenger volume, 17 cu. ft. cargo volume with 2nd row up). The Prius c's smart packaging layout offers elements of convenience and ease- of-operation for driver and passenger. The vehicle has a 20.9 inch hip point (measured from the ground) and a 30.1-inch door opening height (measured from the hip point) to help ease ingress/egress events. The packaging of engine components low within the chassis allows for a lower hood angle, enabling a 9.0-degree angle of depression for the driver. This angle, coupled with a less intrusive A-pillar design help improve the driver's forward visibility. The Prius c's shorter 31.9-inch front overhang contributes to the vehicle's tight 15.7-foot turning radius, helping make it extremely maneuverable in urban settings. The Prius c exterior design projects a fun, youthful attitude for this all-new addition to the Prius family, while offering excellent aerodynamic performance. Adding to its character the Prius c's lower-body styling is wider below the beltline, and features sculpted rear flares to help express a sturdy, athletic stance that communicates a more agile driving experience. The rear design of the Prius c tapers the cabin toward the rear hatch to help enhance aerodynamic performance. Extensive aerodynamic features were engineered into the Prius c to help achieve a 0.28 coefficient of drag. The side mirrors incorporate fins and smooth shapes to aid aerodynamic performance. The Prius c's available exterior colors include vibrant hues that are unique and expressive. The available colors include three new colors – Habanero, Moonglow, and Summer Rain Metallic – along with Blue Streak Metallic, Absolutely Red, Black Sand Pearl, Magnetic Gray Metallic, Classic Silver Metallic, and Super White. The Prius c interior design seeks to create a space that is futuristic yet passenger friendly. The layout of the drive-system controls and the utility functions enhance the feeling of comfort. The thin, wide instrument panels, and placement of displays and controls, help convey a greater sense of spaciousness in a subcompact interior. The door trim, seat surfaces, and instrument panel feature treatments in lighter colors to help create contrast against the base black interior color. The Prius c displays key information on an easy-to-read, digital-display combination meter atop the center of instrument panel, which is offset toward the driver. Locating this digital gauge panel closer to the driver helps reduce the driver's eye movement, and the instrument cluster's revised forward position helps achieve an optimal focal distance from the driver. The Prius c is equipped with an advanced 3.5-inch Thin Film Transistor (TFT) full-color Multi-Information Display (MID) that helps the driver better utilize the advanced features unique to hybrid vehicles. The new color TFT display illustrates drive information and energy usage in a fun, easy-to-read manner. The display offers, Energy Monitor, Drive Information, and an ECO-Score display that illustrates driving scores for each portion of a trip. An ECO-savings display allows for gasoline costs and a comparison vehicle to be pre-set to help the system provide an ongoing estimate of the actual cost savings enjoyed driving the Prius c. The system can also display this data as a longer-term savings record, calculating savings and consumption over the span of months. The Prius c offers a Touch Tracer display that coordinates driver tactile action on the steering wheel controls to a visual indicator on the multi-informational display atop the dashboard to help keep the driver's gaze closer to the road. The Prius c's front seats have been designed to offer enhanced comfort and safety while reducing weight. The Prius c's seat design incorporates a urethane foam material that has been optimized to help reduce the seat's thickness, mass and weight while retaining comfort. The front seats offer improved seatback support with additional foam in the lower back and lateral bolster areas. They also adopt the Advanced WIL (Whiplash Injury-Lessening) structure that simultaneously support the head and lower back in the event of a collision from the rear. The rear seats of the Prius c are available as full-fold or 60/40 split fold, depending on trim level. A denser urethane foam material used in the rear seat structure enables a relatively compact seat design that enables greater luggage area. Seat fabrics available for Prius c include two different kinds of cloth and an available SofTexTM trim. The base seat fabric covering of the Prius c One grade has a solid color with various embossed patterns. The seat trim on Prius c Two and Three grades features a modern two-tone pattern with black bolsters and light blue-gray inserts which provide a pleasing color contrast. The Prius c Four includes premium SofTex trim with heated front seats, offered in black or light blue-gray. Lightweight trim materials are utilized throughout the Prius c interior to help reduce overall vehicle weight. Durable, highly rigid, lightweight materials cover the A- pillar, center pillar, and trim the rear deck area. Lightweight materials are also adopted for the luggage floor, and the floor carpet is composed of a highly durable material that also provides weight savings. The Prius c's door trim expresses a sense of advanced design with its shapes, contours and features. The USB port and auxiliary terminal are located in an open tray area in front of the passenger seat, which is ideal for storing of electronic devices. The Prius c utilizes an efficient, compact air conditioning system. Key air- conditioning system components such as the blower fan, and air flow conduits have been addressed to reduce size and weight, while improving efficiency to help reduce electrical consumption. The system also utilizes a clean air filter that removes pollen, dust, and larger airborne objects. In ECO mode, the air conditioning operation is suppressed to help improve fuel consumption. The Prius c's roof is lined with heat insulating material to help realize better HVAC efficiency. The Prius c offers three audio system configurations; the Prius c One grade's audio system features four speakers and includes AM/FM CD player with MP3/WMA playback capability, auxiliary audio jack, USB port with iPod® connectivity, hands-free phone capability, phone book access, and music streaming via Bluetooth® wireless technology. The Prius c Two grade has the same audio features with a six speaker system. The Prius c Three and Four grades include a Display Audio System with Navigation and EntuneTM that has six speakers. It includes a 6.1-inch touchscreen, SiriusXMTM Satellite Radio capability (includes a 3-month trial subscription to XM Select package), HD RadioTM with iTunes® tagging, and advanced voice recognition. Toyota's EntuneTM multi-media system functions through a smart phone interface that brings applications such as BingTM and Pandora® to the vehicle audio display. This audio configuration also features real-time traffic, weather, fuel prices, sports, and stocks. As with other Prius models, Prius c relies on Toyota's revolutionary Hybrid Synergy Drive® and excellent aerodynamics to achieve outstanding fuel efficiency. The Prius c relies on the seamless operation of two power sources (a gasoline engine and an electric motor tandem) either in parallel or serial operation as a means of propulsion. During deceleration and braking, the electric motor/generator tandem creates energy that is returned to the Hybrid System's battery to help restore charge. The Prius c's gasoline engine and electric motors can work in tandem or individually to propel the vehicle while powertrain operations (level of power application, power split, and regenerative flow) are managed by computer control to best match the application of power to given conditions. The Prius c features a SULEV (Tier 2 Bin 3) compliant 1.5-liter in-line, four- cylinder gasoline (1NZ-FXE) engine that utilizes an efficient Atkinson cycle to improve its efficiency. This engine's Atkinson cycle modifies the engine's intake valve opening events to close later during the compression stroke. This delayed closure allows a portion of the intake charge to be forced back into the intake manifold to be used by the next cylinder, maximizing use of the fuel and improving thermal efficiencies. The 1.5-liter engine in the Prius c also adopts an electric water pump, a micro-polishing process that reduces friction of the reciprocating assembly, and a cooled Exhaust Gas Recirculation (EGR) system that also helps improve efficiency. The Prius c's efficient gasoline engine is mated to a new transaxle assembly that is the most compact, lightweight transaxle designed for a Toyota Hybrid Synergy Drive System which is a two-electric-motor full hybrid system. The new P510 continuously variable transaxle contains two high-output motors (one acts as a starter/generator), a power split mechanism, a speed reducer device, and an open-type differential. and spring characteristics of the transaxle's vibration damper, low noise performance is achieved as well as increased suppression of the vibrations transferred by the engine. The new compact electric motor/ generator design in the P510 transaxle is smaller and lighter weight than previous motors thanks to a new stator design with rectangular coil configurations to achieve higher outputs from more compact dimensions. The Prius c's hybrid system includes a 144-volt nickel-metal hydride battery pack that weighs 67.2 lbs. compared to the 201-volt battery in the midsize Prius that weighs 91 lbs. This battery positioning places mass near the middle of the Prius c's shorter wheelbase (100.4 inches), improving the vehicle's center of gravity to benefit stability and handling. The battery pack itself is comprised of 20 battery modules connected in series with each module containing six cells (total of 120 cells vs. 168 cells in Prius). The Prius c is equipped with a newly designed power control unit that is lighter weight and more compact to reduce overall hybrid system weight. The power control unit contains an inverter, a voltage boosting converter and an AC/DC converter. The system's inverter converts high voltage direct current (DC) from the battery to alternating current (AC) for consumption by motor/generator tandem, and takes the AC power generated by the generator/motor into DC power to charge the battery. The new power control unit weighs three lbs. less than the unit on the Prius Liftback, and it includes an improved cooling system. The inverter's efficiency is improved with a newly designed Insulated Gate Polar Transistor (IGPT) that helps reduce the hybrid system's energy loss to improve fuel efficiency. The Prius c hybrid system's DC-DC converter modifies the power generated by the DC 144v power motor/generator within the transaxle converting the electrical flow to DC 12 volt power. This 12-volt electricity is supplied to the vehicle's auxiliary devices and for maintaining charge of the12-volt battery. The size and weight of the Prius c's DC-DC converter has been reduced while the unit is able to realize improved performance and functionality. Prius c offers three drive modes: Normal, ECO, and EV modes. Using a drive mode switch, operators can engage ECO and EV modes to best suit their driving needs. With Prius c's ECO mode, the engine's throttle opening is reduced by a maximum of 12% compared to normal operation to reduce energy consumption. Also, the air-conditioning system operates in such a way to help reduce energy depletion and enhance vehicle efficiency. For instance, when ambient temperature rises above a preset level, internal air recirculation is activated to minimize air ventilation loss. Also, the blower fan airflow volume can be reduced to encourage fuel efficiency. The Prius c also offers an EV mode that allows the vehicle to be driven a short distance using only the electric motor and hybrid battery for propulsion. The EV mode is well suited to situations when drivers seek to reduce noise while driving in residential areas, or limit exhaust emissions within indoor parking structures, for example. The Prius c can drive approximately one mile at speeds under 25 mph on solely electric power. The Prius c's body structure makes extensive use of light-weight, high-tensile steel to help reduce vehicle weight and help improve fuel economy. The use of high strength steel also lends the Prius c a rigid body structure that also helps enhance occupant safety and vehicle handling. The design of the body's front structure helps disperse impact energies around the passenger cabin, directing frontal crash energies around the passenger cabin and through the floor, rocker structures and A-pillar. The body features a side collision structure that utilizes multiple grades of steel to better manage impact deformity in addition to a reinforced center pillar and rocker panel that use 980 MPA grade steel. The Prius c's roof reinforcement structure uses 590 MPA grade steel to help better resist deformation. applied to the rear door periphery and surrounding the rear suspension to improve the rear structure's rigidity under load. Additional reinforcement metal placed around the rear door openings also help improve the vehicle's torsional rigidity. An aluminum rear bumper reinforcement member is used to help increase rigidity between the rear subframe members, reducing weight while helping control flexing of the subframe to improve handling. The circles and boxes denote area of the Prius c unibody that are supported with sound and vibration absorbing foam. The Prius c shares the suspension design with the Yaris subcompact. The front suspension consists of a Macpherson strut design, and the coil spring and shock-absorber characteristics have been tuned to help stability, flat turning and smooth ride comfort. The front-suspension- bushing characteristics have been tuned to help suppress vibrations transmitted to the vehicle on bumpy roads and help create a flat comfortable drive. A 24.2- mm stabilizer bar is equipped to the front of the vehicle to help enhance turning stability. The tuned torsion-beam rear suspension helps create enhanced ride comfort and provide a smooth, responsive steering feel. The coil spring and shock absorbers have been tuned to offer a high level of stability, flat cornering and smooth ride while minimizing road vibrations. The thickness of the rear beam member has also been optimized to enhance rigidity and provide greater rollover resistance. The Prius c rides on a relatively long 100.4-inch wheelbase, which also helps enhance the vehicle ride quality. Prius c is available with 15- or 16-inch wheel and tire combinations. Fuel- efficient tires that offer lower rolling resistance with improved road gripping performance have been adopted. Aerodynamic considerations helped shape the design of the wheels to help reduce wind resistance and improve fuel economy. The Prius c is equipped with a column- type Electric Power Steering (EPS) system, which offers reduced steering efforts and power consumption with the adoption of an efficient electric motor and reduction gear that increase power assistance. Among the equipment available for the Prius c Four grade are aluminum-alloy 16-inch wheels which are also accompanied by a quicker steering ratio. The ratio yields 2.28 turns lock- to-lock, compared to the 3.02 turns with the 15-inch wheel specification. The steering column is a lightweight, compact manual tilt/telescopic assembly. The Prius c's driver controls a D-shaped steering wheel that offers additional knee clearance for easier ingress/egress. The Prius c is equipped with several active and passive safety elements. The Prius c is equipped with nine airbags, including driver and front passenger Advanced Airbag System, driver and front passenger seat-mounted side airbags, driver and front passenger seat cushion airbags, front and rear side curtain airbags, and driver's knee airbag. Star Safety SystemTM includes Vehicle Stability Control (VSC), Traction Control (TRAC), Anti-lock Brake System (ABS), Electronic Brake Force Distribution (EBD), Brake Assist (BA), and Smart Stop Technology (SST). The Prius c will also come standard with Toyota Care, a complimentary plan covering normal factory-scheduled maintenance and 24-hour roadside assistance for two years or 25,000 miles, whichever comes first.